Since 1970, Earth Day has been raising public awareness of environmental issues. Today, our waterways are less polluted and our air is cleaner, yet there is still much work to be done before we can consider ourselves a sustainable society. 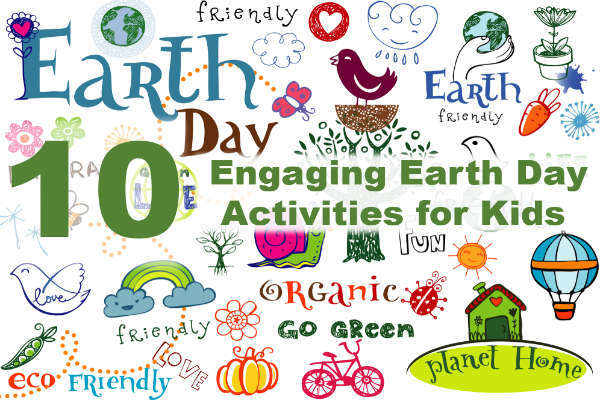 This year, engage your students or children with one of these eco-friendly activities on Earth Day or the weeks leading up to it. It may seem cliché, but planting a tree is a simple act that helps the environment and gets children outdoors enjoying the natural world on Earth Day. Coordinate with your school a place on the grounds where your class can plant a tree or check with your local conservation board for a public location. Apply for free trees through organizations like Trees for Schools (UK and Ireland only) and Trees for Wildlife or by having students write to local nurseries. April is National Garden Month, making Earth Day the perfect time to plant a school garden. Gardens are an excellent way to get kids moving, encourage healthy eating, and incorporate project-based learning into your curriculum. A school garden takes time and commitment, but in planning and raising a garden, you will sow seeds that will help your students reap a lifetime of rewards! Get started with these school gardening tips. During the week leading up to Earth Day, arrange with the custodian not to remove the trash and recycling from your classroom. On Earth Day, have your students weigh the trash and recycling they generated (weigh trash separately from recycling). Over the next week, challenge your students to toss and use less, plus recycle more. After a week, have students weigh the trash and recycling again and calculate the decrease (hopefully!) in trash weight and increase in recycling weight. Extend the lessen for older students and have them calculate percent increase and decrease as well. Get started by assigning the lessons Reduce, Reuse, Recycle and The Trash Patrol, then read our America Recycles Activity Guide for more ideas. It is good for the environment and our children’s health. More and more schools are planning annual walk or bike to school days. Why not plan one for April 22 or use Earth Day to have your students start planning for National Walk to School Day in May? Visit the Walk & Bike to School website for more information on getting started. With the help of your class and the EPA’s Pack A Waste-Free Lunch site, make Earth Day a school-wide commitment to reducing the mounds of garbage generated during a typical school lunch. Have your class coordinate with administrators and cafeteria workers and help spread the word to students and parents about what can be done to minimize lunch waste. Get your students excited for Earth Day by engaging them with these interactive lessons on Climate Literacy and Environmentalism by PBS Learning Media and with Help Teaching’s self-paced science lessons. Engage your children or students in authentic science by participating in an eco-themed crowd science collaboration. There are numerous projects running that allow students to participate with adult supervision, including the environmentally oriented: Forgotten Island, YardMap, The Lost Ladybug Project, and Globe at Night. What student doesn’t love a field trip? Plan an inexpensive day out by arranging tours of your local landfill, recycling center, wastewater treatment facility, and/or power plant (even better – visit a plant that uses renewable energy and one that uses a nonrenewable source). Yes, it will be dirty, hot, and smelly, but what better way for students to develop an understanding of where energy comes from and trash goes than to see it for themselves? Enlist your students in finding local professionals working in environmental careers to visit the school on Earth Day. Arrange for a career fair that allows students to hear about green jobs and discuss job duties with the professionals. Have students prepare questions ahead of time and write thank-you notes after. Challenge students to work in small groups to perform an energy audit of their school. Each group can audit energy use for a given building space like the classroom, cafeteria, gymnasium, or auditorium. Groups can share their results and compare their findings, then use the data to prepare an energy action plan to present to school administration. National Wildlife Federation and Green Education Foundation both offer resources for energy audit projects for students. Ask your students to bring in a variety of cleaned items from their home recycling containers during the week leading up to Earth Day. On April 22, divide your students into teams and task them with designing and building a machine that completes a simple eco-friendly task such as turning off the lights or watering a plant. Provide basic materials, like string and wine, to aid in construction. Be sure and have your students demonstrate their machines for an audience and see if their projects can be displayed in the school lobby or library. Spring has sprung and students are anxious to get outside, making Earth Day is the perfect time to embark on an environmentally focused project-based learning (PBL) initiative. BIE.org offers extensive PBL resources for teachers and students – start by using their search tool for project ideas. Be sure to visit Help Teaching’s Earth Science Printables and Lessons for free environmental science resources to use on Earth Day and year round! Ripley’s Believe It or Not, Weird But True, and other enterprises like them have made an entire business of highlighting the odd, wacky, and incredible things the human body can do. Yet, engaging high school students in a topic that they may feel they already know enough about (after all, don’t we walk around in these bodies every day?!) can be a challenge. 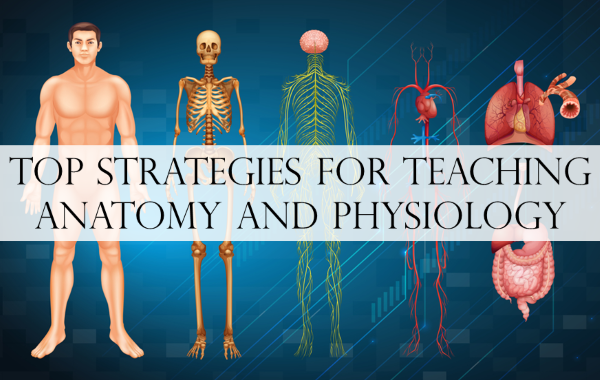 Bring anatomy and physiology alive in the classroom setting with these strategies and resources that will draw students in, hold their interest, and maximize their learning. Anatomy, or the study of the structure of body parts, and physiology, or the study of the function of body parts, may be offered as a separate course in some high schools or may be integrated into various topics within a biology course, including botany and the human body. Therefore, neither anatomy or physiology is completely new for students in the upper grades. The key is to explore this wide range of topics in a way that students find fresh. But why are anatomy and physiology so important? The study of the structure and function of the body is crucial for the basis of health and medicine. Today’s technology for diagnosis and management, pharmaceutical development and application, and techniques for the treatment or prevention of disease—all depend on anatomy and physiology. Understanding the anatomy, physiology, and pathophysiology of our own bodies make us all more science literate—more capable of asking the right questions, understanding relevant concepts, and making sound decisions about our health. An anatomy and physiology course integrates both the life sciences and the physical sciences of physics and chemistry—much like biochemistry—and provides a natural interdisciplinary approach to topics from the simple to the complex, allowing students to begin to understand the relationships between various branches of science. The field of anatomy and physiology is a wonderful example of exploring a single entity—the human body—by breaking the overwhelming expanse of it into systems. The systems can then be examined independently and relative to one another. The skills of analysis, synthesis, and making connections can also be applied across disciplines. Learning anatomy can be a huge exercise in memorization because of the many structures in the body, such as the skeletal and muscular systems. Developing techniques and ability for memorization will serve students in any subject. Not every student in a biology or anatomy and physiology course is interested in pursuing a career in health and medicine in college or professional school. So how do you keep all the students in your classroom engaged in learning? First, students need to feel that the subject matter has relevance in their world. That’s the easiest part; every student in your classroom has a body! 1. Introduce material with a story. Be clear about objectives for the lesson or unit. This may include a list of vocabulary terms and key concepts. Then find resources that will lay a foundation of interest while touching upon these terms and concepts. A news story, podcast, or segment from a network program could fit the bill perfectly. A quick online search can bring up interesting stories that cover just about any organ system. Body Pods podcast. A series of seven podcasts, each is a unique focus on a part of the body and is produced through a collaboration of an artist and a scientist in the field. LiveScience online. Read about some of the strangest medical reports, affecting systems from the eye to the gut. ABC News online. This article covers baffling medical conditions. Present only the portion that is relevant to the current topic. While some students may find themselves squeamish with any content dealing with the body, do exercise caution in avoiding exploitative or insensitive material. Human cardiovascular and respiratory function. 3. When real-life experience is impossible, look for the next best thing. Images, animations, videos, and simulations abound in the world of anatomy and physiology for both states of health and disease. The Visible Body. This website has apps of images and simulations that cost, but there is also free content available. Videos Medical. A YouTube channel, this video series shows blood moving through a beating heart or bones and muscles putting the body in motion. MedLinePlus Surgical Procedures. These videos show actual surgeries, from angioplasty to knee replacement. Warning: Some videos can be quite graphic, so preview thoroughly before introducing to students. 4. Explore and solve a medical mystery. Use case studies as a culminating activity to reinforce vocabulary and concepts. Alternatively, case studies could be the primary method for covering a unit. Although a complete inquiry process would most likely take much longer than allowable in a course, allowing students to form groups under a system of their choice would allow for more in-depth examination and understanding. Groups work independently then present their case study, course of action, and conclusions to the entire class. Students work together to learn the anatomical structures and major physiological concepts of their system, common disorders and diseases of the system, and methods and techniques used to examine and assess the system. Students could broaden their resources, reaching out to experts in the field locally or digitally, as available. Remember to make instruction effective by engaging students right from the beginning, checking in using assessments and questioning, allowing for collaborative learning, and providing feedback throughout the learning process. For more great anatomy and physiology teaching resources, try our biology worksheets and online biology lessons. Dana Johnson is a freelance editor and writer specializing in science education. Using every bit of her experience as a corporate and government scientist, high school science teacher, and academic specialist, Dana creates, reviews, and edits premium science materials for secondary and higher education. She currently serves as Help Teaching’s biology subject matter expert. When not working away at her laptop, Dana loves reading, journaling in long hand, gardening, and patronizing the arts. Looking to invigorate your science curriculum and teaching this year? Help Teaching’s team of teachers understands the time and commitment it takes to prepare meaningful science classes and lab activities, not to mention stay up-to-date with the latest scientific advances. Updated for the 2018-2019 school year, we have gathered links to over 80 of our favorite resources to help support rookie and veteran science teachers and homeschooling parents alike. This year we’ve added several new science sites and a new category for our favorite engineering sites. Happy Teaching! Whether or not your state has adopted the new science standards, they have been released and are the talk of the science teaching community. Bozeman Science provides a free series of NGSS videos on each of the disciplinary core ideas. The videos give a clear overview of each standard as well as suggestions on how to teach the core ideas at the elementary, middle, and high school levels. NGSS@NSTA provides current information about the implementation process and professional development opportunities, including free web seminars, to support science teachers looking to incorporate the standards into their curriculums. NGSS is the primary resource for teachers looking to read and learn about the new science standards. Teachers may find the EQuIP Rubric overview page useful for identifying high-quality instructional materials that align to the standards. The National Academies Press offers several NGSS-related publications useful for teachers, many of which can be downloaded for free after creating an account. PBS LearningMedia NGSS links to a large collection of NGSS resources for professional development and classroom use. Parent Q&A is a flyer designed to answer parent questions about the Next Generation Science Standards, but is also a nice overview for teachers and administrators. The Concord Consortium features a unique tool that allows educators to navigate the NGSS by core idea, practice, and crosscutting concept and locate high-quality digital activities that support the standards. Check these sources regularly to stay current with scientific research. Better yet, have your students read them as well! Newsela website and app keep educators and students alike up-to-date with current events, including a large selection of STEM news stories at different reading comprehension levels. Registering for the free version of the platform allows teachers and students unlimited access to articles. Scientific American maintains a section dedicated to education that includes activities, information on their program connecting teachers and scientists, tips on improving science literacy, and more. Live Science will help keep you up to date with science headlines across disciplines. BBC Science & Environment is the place to go for breaking science news. Whether you are a busy science teacher or student looking for the hottest topics in science, BBC has coverage for you. Science Daily offers a compilation of breaking news articles for those interested in the latest research. ScienceBlogs hosts posts from over sixty blogs, presenting a wide range of science news and viewpoints. HuffPost Science will help keep you up to the minute with breaking science stories. NewScientist shares topical new stories on all things science related. Like the scientific method, great science instruction takes systemic modifications. Read on for resources that will help invigorate your science teaching. Good Thinking! The Science of Teaching Science by the Smithsonian Science Education Center houses a collection of must-watch videos for anyone who teaches science. These short, animated videos explore common student misconceptions on topics ranging from natural selection to chemical reactions. NSTA Learning Center links science teachers with professional development resources by subject and grade. Be sure to peruse their collection of 4,000+ free articles, web seminars, podcasts, and modules available to support your professional growth. What Works Clearinghouse reviews and summarizes education products and research to help educators make evidenced-based decisions when it comes to teaching. SERC is working to improve STEM education by providing a rich assortment of professional development opportunities and resources for educators. Understanding Science is a primer for teachers and students alike on what science is and how science really works. BSCS Science Learning helps to transform science education by working with science educators worldwide to provide a variety of resources. They conduct research on improving science instruction, develop instructional materials, and offer professional development. Help Teaching’s library of printable science worksheets are ideal for practice and assessment. Our growing collection of self-paced science lessons for biology, chemistry, physics, and earth science are a great way to introduce topics and reinforce learning. Science competitions and fairs can inspire students to pursue STEM careers while providing hands-on learning opportunities. Consider challenging your students to participate in a local science fair for one of these major science competitions: Young Scientist Challenge, ExploraVision, Regeneron STS, & Google Science Fair. Science lends itself to hands-on activities that engage students in active learning. Save time and get inspired when preparing lessons this year by reading these links. Science Friday partners with educators and scientists to create STEM activities, lessons, and resources for all learners. This site connects teachers with relevant, unique, and dynamic instructional materials, videos, stories, and more. ScienceNetLinks brings together a large, searchable database of science lessons, interactive tools, news, and hands-on activities to support formal and informal science education. Science Buddies is the place to look for science fair topics and activities. Not only does Science Buddies provide science fair project resources for students and teachers, but their growing collection of science activities are perfect for classroom and home use. BIE maintains a library of science project-based learning units that encourage student inquiry and investigation. Lawrence Hall of Science: 24/7 offers citizen science projects, hands-on activities, online games, and more for classroom and home exploration. PBS LearningMedia has thousands of the best digital science teaching resources in an easily searchable platform by grade, subject, standard, and format. Zooniverse brings together a collection of citizen-science, or people-powered, research projects where everyday people can contribute to real science. Science Kids has a nice collection of experiments, science fair project ideas, games, videos, and images designed to get kids interested in science. Annenberg Learner brings together a collection of science interactives that can readily support any science curriculum. Virtual Microscope simulates the use of various types of microscopes for students through the examination of set image samples. PhET Simulations supplement classroom learning with a large array of well-designed science interactives. The Science Spot contains a vast library of information and resources pertaining to all areas in science, including forensic science and astronomy. This is an essential resource of middle school teachers and students as well as for high school teachers. This website also provides tips for implementing interactive science notebooks in the classroom. Hook your students on science by sharing videos from Veritasium, Science360, SciShow, It’s Okay to Be Smart, Untamed Science, and Help Teaching. We teach our students that collaboration is an essential part of doing science. Practice what you teach with these links for connecting and sharing with teachers who have similar goals. Teaching Channel is on a mission to create an environment where teachers can watch, share, and learn new techniques to help every student grow. Start by watching these science videos, then explore the entire site for more teaching inspiration. Skype in the Classroom helps teachers connect with other educators and experts in their fields. Use Skype to bring your students on virtual field trips, interact with a virtual guest speaker, and collaborate with another class from across the country or around the world. STEM on Google+, and STEM Educators are Google+ groups offering vibrant online communities of science teachers sharing resources and best practices. Professional Learning Communities allow teachers to connect with others in their schools, districts, and communities who are dedicated to science education. Google Educator Groups bring educators together, both online and offline, to share ideas on web-enabled learning. AP Teacher Community connects and supports those instructing AP courses. Don’t miss out on the latest discoveries about the universe with these links. NASA Education for educators opens a universe of information about space science through lessons, videos, professional development, and more. Get started by browsing astronomy teaching resources in NASA Wavelength. Google Sky does for the view of space what Google Earth does for the view of your neighborhood. Air and Space Live webcasts from the Smithsonian National Air and Space Museum brings a world and beyond of learning opportunities for anyone interested in astronomy. If the Moon Were Only 1 Pixel dubs itself, “a tediously accurate scale model of the solar system,” but don’t be misled by the tagline. This interactive is beautiful in its simplicity and will engage your students on this virtual journey through our solar system. National Optical Astronomy Observatory offers numerous space-based resources, programs, and resources for education purposes. From life science to AP biology, helping students develop an understanding of the nature of life is essential for science literacy. BioEd Online from Baylor College of Medicine offers science teachers resources that include lessons, videos, classroom slides, and a full library of magazines and storybooks for use with K-12 students as well as professional development courses for teachers. BioInteractive by the Howard Hughes Medical Institute is a free collection of virtual labs, films, animations, apps, and more that are ideal for biology education. Encyclopedia of Life offers an extensive collection of free resources on just about any organism. The Biology Corner offers a wealth of teaching resources for biology teachers, including classroom presentations and lab handouts. Ask a Biologist not only allows K-12 students to submit questions for biologists to answer, but also offers a wealth of biology-related articles, activities, games, and more. Solve the Outbreak is a free app by the CDC that challenges students to solve epidemiology mysteries. It’s fun, really! Cells Alive brings microbiology to life through amazing photos, interactives, and videos. BEN: BioSciEdNet managed by the American Association for the Advancement of Science, helps teachers to engage their students with animations and lab activities. Biology4Kids offers clear explanations of many topics for elementary and middle school reading levels or for teachers searching for material covering the basics, from scientific study to cell biology. American Physiological Society supports education through student activities and curricula, education projects that link teachers and physiologists, and teacher learning resources. Teaching the central science takes knowledge, skill, and a bit of wow factor. Use these links to help make your class preparations a little easier. American Chemical Society’s education page is the place to find materials for teaching chemistry, professional development opportunities, and reports on chemistry education. ScienceGeek.Net is chemistry teacher Andy Allan’s personal website where he shares his collection of presentations, labs, and more. Evan’s Chemistry Corner provides worksheets, transparencies, and lab activities for Regents Chemistry in New York State, but these resources can be used in any high school chemistry classroom. Kent Chemistry contains instructional pages covering topics in chemistry, along with accompanying videos, practice questions, worksheets, and lab activities. Both high school-level and AP chemistry are covered. Illustrated Glossary of Organic Chemistry catalogs 1,500+ terms and is an essential resource for any organic chemistry course. Periodic Videos from the University of Nottingham features videos and experiments on each element. Check out their 500 videos on YouTube as well. Crash Course Chemistry contains a playlist of YouTube videos covering various topics in chemistry in a short amount of time. Chemmy Bear contains a multitude of resources for AP chemistry, from handouts and activities to study cards and practice tests. This site is especially helpful for newer AP chemistry teachers and for teachers of honors chemistry courses. Developing student understanding of the earth’s structures and processes helps nurture an appreciation of the natural world. EarthLabs supplies rigorous units on earth and environmental topics that focus on hands-on laboratory activities and data analysis. Each unit provides all the information, resources, and lessons necessary to elevate earth science and environmental lab instruction to the next level. NOAA brings together a wonderful collection of resources about the oceans and atmosphere. USGS Education compiles a wide variety of videos, maps, images, and interactives ideal for use in the earth science classroom. ClimateChangeLIVE engages students with two electronic field trips for the classroom as well as supplemental materials and support for teachers. COSEE is dedicated to helping build collaborations between students, teachers, and scientists interested in ocean studies. Physics is daunting for many students. Great physics teachers actively engage students with the study of the interactions between energy and matter. The Physics Classroom supplements physics instruction with tutorials, animations, teacher toolkits, and lab activities. The Physics Front is an extensive collection of materials, including online tools and lesson plans for K-12 physics and physical science instruction. PhysicsCentral shares everything from articles to posters to home projects to support those educating physics students at all levels. APlusPhysics contains helpful video tutorials and webpages for students to learn from, covering topics ranging from high school physics to AP physics. The site also contains worksheets for teachers to print and distribute to students as well as activities that teachers can implement. Burrows Physics‘ playlist contains a multitude of videos covering various higher-level physics topics. These are helpful in providing instruction to students outside of the classroom. Practical Physics offers a wide array of experiments that enable students to get hands-on experience with concepts in physics, enriching students’ understanding and refining students’ ability to visualize the forces and science at play in the real world. ComPADRE is a digital library of teaching resources for physics and astronomy educators. American Association of Physics Teachers will keep you posted on conferences, projects, and competitions as well as just about everything you need to stay up to date with teaching physics. Today’s science students must understand engineering practices and design solutions to help them prepare for everyday life and career paths. Enrich your STEM curriculum with these engineering resources. TeachEngineering is a website that guides teachers in nurturing students’ abilities to create innovations to challenges in any subject. Some activities include how-to videos on YouTube. NASA Engineering Design Process aids teachers in helping students to understand that engineers must imagine and plan before they begin to build and experiment in a variety of challenges for K-2, 3-5, and 6-8. The site also provides plenty of guidance for supporting students in the engineering design process. Science Buddies offers educators an exhaustive description of the engineering method with a side-by-side comparison against the scientific method. TryEngineering has 100+ engineering lesson plans for teachers. Students interested in pursuing engineering careers will find the university and careers portals useful. EngineerGirl by the National Academy of Engineering offers a wealth of information on engineering professions for girls and women. Although this list is by no means comprehensive, we hope it will inspire and energize your science teaching and classroom this year. Be sure to visit HelpTeaching.com and utilize our growing library of K-12 science worksheets, lessons, and questions! Popular television shows like Law & Order: SVU have captivated countless audiences by providing a bridge between chemistry, forensics, and the law. Help Teaching understands the challenges of engaging students in chemistry as a discipline and as a practice. Here are some ideas and strategies to help make chemistry come alive through forensics during National Chemistry Week and throughout the year. Careers in Forensic Chemistry – What better way to kick off the beginning of the year than by introducing students to the possibility of a career in forensic chemistry? Students will love the idea of being able to work with and analyze blood, poisons, and metals in bullets. Chemistry & Forensic Science in America provides a historical timeline of how chemistry was used to make important advances in the field of forensic toxicology. This timeline can be consulted throughout the year as a resource to motivate and intrigue students. Some possible points of interest include an exploration of chemical and physical properties of the element radium in early 20th Century America and an introduction to types of chemical reactions through a discussion of the Marsh Test in detecting the presence of arsenic in human tissue. The Poisoner’s Handbook can be used as a video to kick off a unit on nuclear chemistry or on the Periodic Table, with a focus on early American medicine. The Poisoner’s Handbook has also been published as a book, which could serve as a book that students refer to throughout the year to encourage discussion and literacy in chemistry to support the Common Core Learning Standards. Chymist – Forensic Chemistry provides a list of invaluable resources from which to download class readings and investigations as they relate to important topics in forensic investigation. These articles help to encourage literacy and can serve as introductions to experiments that students conduct in the classroom. ACS: Celebrating Chemistry provides a list of fun and engaging forensics-based activities to try with your class. Forensics from nclark.net provides links to a multitude of resources that relate forensic science and chemistry to one another. Using these resources, you can find various experiments and activities to cover topics and skills that are being taught in your classroom, while simultaneously engaging students. CSI Web Adventures offers a collection of interactive cases based upon the television series. 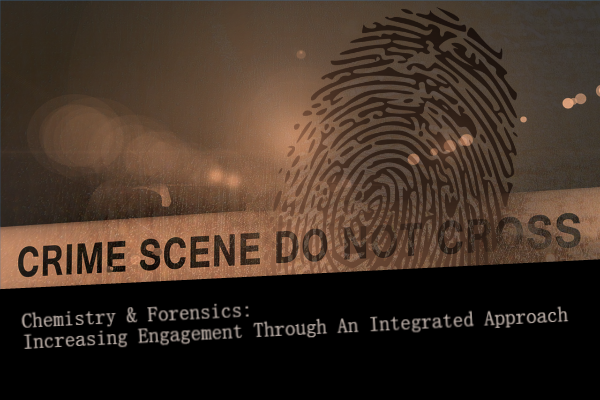 Cases range in difficulty level and make for engaging activities to hook middle school and high school students interested in learning about forensics. Teaching chemistry to students who have no prior experience can be a daunting task. However, approaching chemistry from the perspective of society and the law can open new doors and leave a lasting effect on students. Have other ideas about how to teach chemistry through forensics? Share your thoughts and ideas with us in the comments section below. Also, make sure to check out Help Teaching for chemistry worksheets and online chemistry lessons. Looking for more great science teaching ideas? 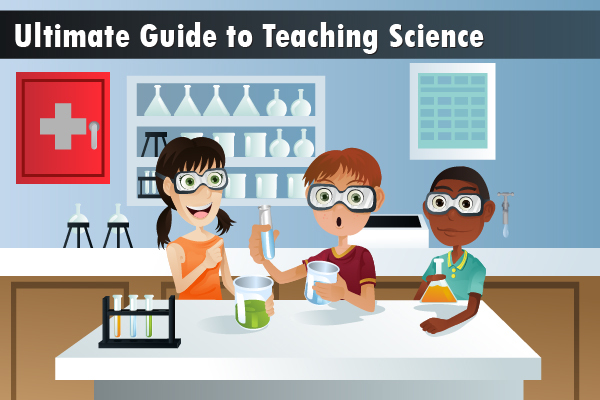 Read our Ultimate Guide to Teaching Science! Top STEM Competitions – Could Your Student Be the Next Winner? Science, technology, engineering, and math (STEM) contests and competitions benefit students in many ways. They can inspire students to pursue careers in STEM-related fields and challenge teachers and homeschool parents to take STEM education to the next level. Quality competitions provide students with hands-on practice and application of core STEM concepts they are studying and support project-based learning initiatives. 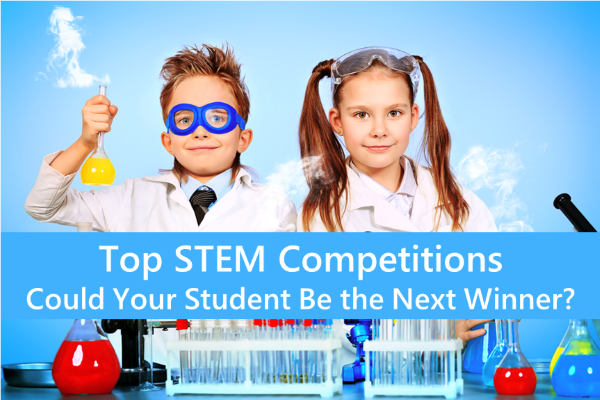 Updated for the 2018 – 2019 school year, we’ve gathered a list of the top STEM competitions by age group to help you find the perfect opportunity for your students. Curriculum Alignment – Does the competition directly support your curriculum and education standards? Do you have the classroom time to devote to working with students on their entries? If not, consider starting a school club dedicated to the project. Cost – Many competitions cost nothing other than time, others require the purchase or donation of materials, and still others require travel and associated expenses. Determine your budget prior to selecting a competition to avoid student disappointment if funding is not available. Timeline – Each competition will have a set competition timeline. In addition, some will require registration well before the submission deadline. Make sure the timeline works with your teaching schedule so students have ample time to complete quality projects. Individual vs. Team – Science is collaborative and so are many STEM competitions. Decide if it is best for your students to compete individually, in small teams, or as a class, and then select a competition that fits those needs. America Computer Science League – The ACSL challenges students in grades 3 – 12 to solve computer science and programming problems in this international competition divided into division by age group and computing experience. ExploraVision – The National Science Teachers Association and Toshiba ask small teams of K-12 students to envision what a current technology will look like in the future. The ExploraVision competition has refocused over the past several years to align with Next Generation Science Standards. FIRST – With school teams and clubs worldwide, hundreds of thousands of students grades K-12 participate annually in FIRST’s hands-on robotics programs and competitions. NASA Ames Space Settlement Contest – K-12 students design permanent orbital settlements. There are contest categories for students in each grade 6 – 12 and for individuals, small groups, and large groups. National Science Bowl – Sponsored by the U.S. Department of Energy, the National Science Bowl challenges middle and high school students to face-off in a question-style science and math contest. Science Olympiad – With competitions in all fifty states, the Science Olympiad is one of the best-established STEM competitions around for students in grades 6 – 12. Tournaments focus on teamwork and consist of standards-based challenges. Team America Rocketry Challenge – Middle and high school students take part in designing, building, and flying rockets complete with “astronaut” eggs. TEAMS – Middle and high school teams of four to eight students contend in this engineering-based competition that involves hands-on design challenges, multiple choice questions, and an essay based around an annual theme. National Science Bee – This bee-styled tournament for elementary and middle school students covers science, math, and engineering topics and culminates in a national championship. EngineerGirl Essay Content – Each fall the site posts an engineering related prompt for students grades 3 – 12 to write about. Despite the name, the content is open to all students in grades 3 – 12, not just girls! Game-a-thon – From cards, to dice, to board games, games make for creative, hands-on learning. In this competition, students create games based on math concepts and submit videos of their games in action. American Geosciences Institute Contests – In honor of October’s Earth Science Week, the AGI offers several annual contests for kids that celebrate Earth through visual arts, a nice option to support STEAM curriculums. VEX Robotics Competition – Get student teams designing and building robots in this popular game-based engineering competition. MOEMS – This Math Olympiad for students in grades 4 – 8, allows students to compete in teams of up to 35 via an online monthly math test. Discovery Education 3M Young Scientist Challenge – In this competition, students in grades 5 – 8 create videos on unique solutions to everyday problems. Multiple levels of prizes are given, including a $25,000 grand prize. Future City Competition – Middle school student teams use the engineering design process to create a city 100 years in the future that solves a sustainability issue. Competition elements include virtual city design, physical model construction, essay, and a presentation. MATHCOUNTS – Each four-student middle school team creates a video that teaches the solution to and a real-world application of a math problem selected from the MATHCOUNT’s handbook. MATHCOUNTS also offers “bee” style competitions and club programs. eCYBERMISSION – This web-based competition, sponsored by the U.S. Army, is for teams of students in grades 6 – 9 and focuses on real-life applications of STEM. SourceAmerica Design Challenge – High school students innovate workplace technologies that diminish obstacles standing between people with disabilities and employment opportunities. Google Science Fair – Students 13-18 perform in-depth investigations of real-world problems in this competition that awards many prizes in different age categories. Imagine Cup – Microsoft’s Imagine Cup challenges high school students worldwide to create software applications that help resolve some of the world’s most challenging problems. Mathworks Math Modeling (M3) Challenge – A free, internet-based math challenge for juniors and seniors that addresses a real-world problem. The competition offers numerous scholarships to top-placing teams. Clean Tech Competition – Individuals and small student groups research, design, and produce papers around a real-world environmental theme that integrates eco-friendly energy sources. Regeneron Science Talent Search – Billed as the oldest U.S. science and math competition, this one is limited to high school seniors who submit original science research. The top 300 entries earn cash prizes and finalists will go on to compete for $250,000. Math Prize for Girls – This is a competitive math prize for high school girls, held at the Massachusetts Institute of Technology each fall. Only 300 students will be selected to compete and applicants must take an American Mathematics Competition exam prior to applying for this competition. This is just a sampling of the many STEM competitions available. Many students also participate in local and regional science fairs that allow students to conduct and present authentic research and potentially compete at the national level in competitions like the Intel International Science and Engineering Fair and Broadcom MASTERS. However, most students will not win a national competition, so before entering students in a competition, consider the intrinsic value of participation. Look for well-organized competitions that offer clearly defined rules and judging criteria, as well as constructive feedback for all participants. Remember to check out Help Teaching’s collection of science worksheets and online lessons to support your science teaching needs. If you enjoyed reading this article, try our Ultimate Guide to Teaching Science. 2019	HelpTeaching.com	© 2004-2013 Tribrio, Inc. All rights reserved.